Changes to bin collections in Leeds have been labelled "a shambles" by one councillor after hundreds of homes were left without collections for weeks. Residents living in the Headingley and Hyde Park areas of the city have seen rubbish piling up on their streets. Councillor Jamie Matthews said people did not know which day their bins would be emptied. "It's a shambles," he said. Leeds City Council apologised for the situation and said extra crews were dealing with uncollected bins. 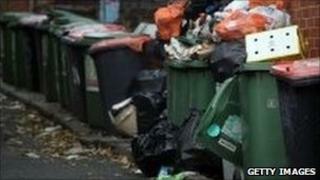 One resident told BBC News that when she complained about the uncollected rubbish she only received an e-mail. "They don't do anything," she said. Mr Matthews, who represents the Headingley ward, said there was confusion in the area about the revamped bin collection timetables. He said: "Some people think their bins are being collected on a Tuesday, some on a Wednesday. "It's been a complete shambles so there are just bins sitting uncollected on the street." In a statement, Leeds City Council said: "We apologise for problems caused by the new bin collection routes. "We want to reassure residents they will be resolved as quickly as possible. "Extra recovery crews are dealing with uncollected bins in affected areas."" The council said the new system would be more efficient once crews had adapted to them. The changes designed to improve the productivity of bin collections in Leeds were made in October. Refuse and recycling collection routes across the city were overhauled to make them more efficient, in a move the council said would save it £2.4m a year. The efficiency measures were part of a deal that ended last year's 11-week strike by refuse workers.